State Bank of India (SBI) savings bank account holders can open fixed deposit/term deposits using Internet banking facility. Using SBI’s online banking platform, SBI account holders can open e-fixed deposits sitting at the convenience of their home, no need to visit bank. With online fixed deposit facility SBI account holders can also give their preference for maturity payment proceeds, renewals, interest payment options etc. 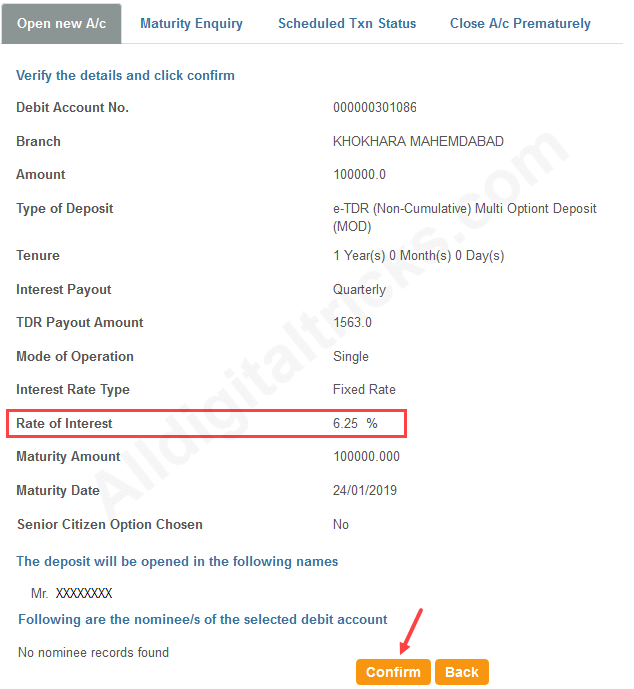 Here we will show you step by step process – how to open fixed deposit in SBI using net banking facility. 3 In next screen, select your type of deposit and proceed. Income tax saving scheme has lock-in period for 5 years. The MOD (Multi Option Deposit) account is a combination of your transactional (debit) account and deposit account. These are the Time Deposits but at the time of need for funds, withdrawals can be made in units of Rs.1,000/- from the deposits by issuing a cheque from Savings Bank Account or from ATM / branch or through any other channel. 4 In next screen complete your fixed deposit and submit. e) Here we selected e-TDR, so we will get interest monthly or quarterly. 5 In next page confirm your FD. Here you can see Interest rate also. 6 Done! you have successfully opened fixed deposit account in SBI. 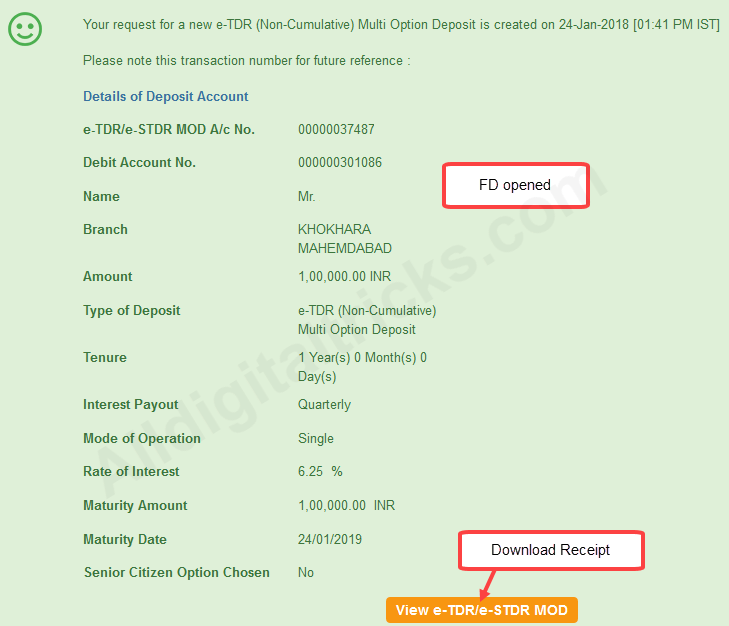 Now click on view e-TDR/e-STDR and download your receipt. 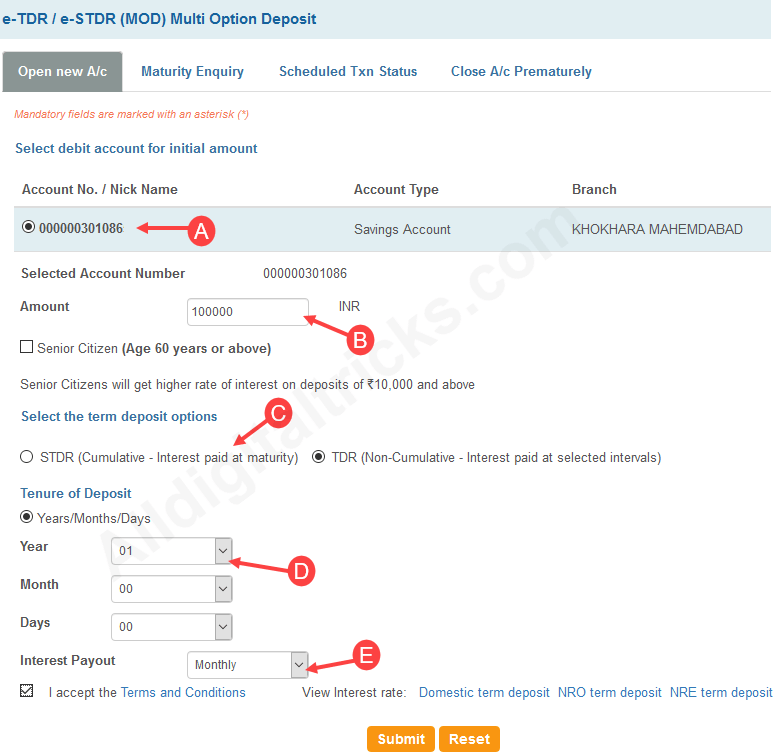 So this is how you can easily open fixed deposit online in SBI through net banking facility. 1. What is the minimum tenure for an online deposit? As a general rule the minimum tenure for a term deposit is 7 days and the maximum is 10 years. However Both TDR and STDR are bound by the following minimum and maximum tenures. Minimum tenure is 7 days for TDR and 180 days for STDR and Maximum tenure is 3650 days for TDR and STDR. 2. What are the interest rates for a term deposit? The interest rates vary from time to time. You can view the latest interest rates by clicking on “View current interest rate” link provided in e-TDR/e-STDR request page. 3. Can I generate a term deposit advice? Yes, you can generate and print a term deposit advice containing all your relevant details. 4. Can I close my e-TDR/e-STDR instantly through ‘close a/c’ tab? Yes, you may close your e-TDR/e-STDR instantly if request is initiated between 08:00 AM IST to 08:00 PM IST. Request initiated beyond this period will be scheduled for next opening hours ie 08:00 AM IST.